[142 Pages Report] The global power system simulator market was valued at USD 785.3 Million in 2016 and is projected to reach USD 1180.6 Million by 2022, growing at a CAGR of 7.14%, from 2017 to 2022. The booming power sector and augmented power generation capacities, rising adoption of IoT and cloud platforms, and reduced overall project time and cost are driving the power system simulator market globally. The power system simulator market has been segmented based on module, offering, end-user, and region. This research study involved the use of extensive secondary sources, directories, and databases, such as Hoover’s, Bloomberg Businessweek, Factiva, and OneSource, to identify and collect information useful for a technical, market-oriented, and commercial study of the power system simulator market. Primary sources are mainly industry experts from the core and related industries, preferred suppliers, manufacturers, distributors, service providers, technology developers, standards and certification organizations of companies, and organizations related to all the segments of this industry’s value chain. The points given below explain the research methodology. After arriving at the overall market size, the total market has been split into several segments and sub-segments. The figure given below illustrates the breakdown of primaries conducted during the research study, based on company type, designation, and region. 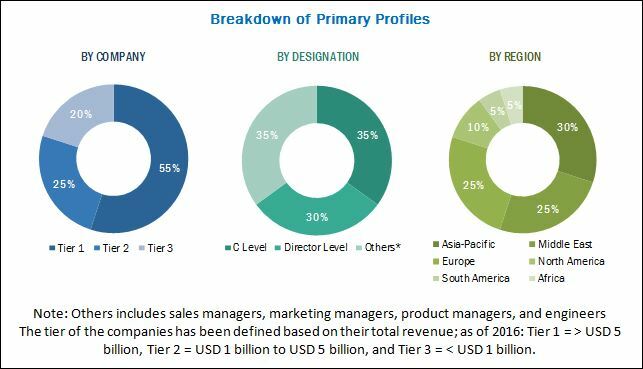 The power system simulator market ecosystem comprises companies such as ABB (Switzerland), Schneider Electric (France), Siemens (Germany), GE (US), ETAP (US), RTDS Technologies (Canada), MathWorks (US), OPAL-RT (Canada), and Eaton (Ireland). The global power system simulator market is estimated to be USD 836.1 Million in 2017 and is projected to reach USD 1,180.6 Million by 2022, growing at a CAGR of 7.14%, from 2017 to 2022. The booming power sector and augmented power generation capacities, rising adoption of IoT and cloud platforms, and reduced overall project time and cost are driving the market for power system simulators globally. 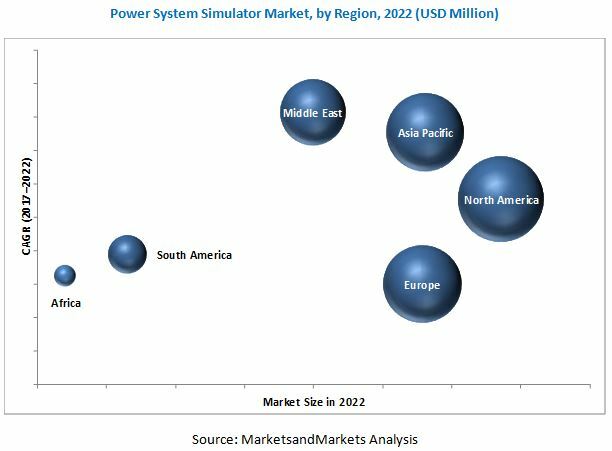 The power system simulator market has been segmented based on offering into hardware, software, and services. The software segment is expected to be the largest due to the upgradation of existing software to the latest versions and upcoming technologies. The power system simulator market has been segmented based on module into load flow, short circuit, device coordination selectivity, arc flash, harmonics, and others. The others segment includes motor acceleration, sequence of operation, transient stability, and reliability assessment. The load flow module segment is estimated hold the largest share of the market during the forecast period. Upcoming power projects in economies such India, Indonesia, Malaysia, South Africa, and Qatar are expected to boost the demand for load flow modules during the forecast period. The power system simulator market has been segmented, by end-user, into power, industrial, and others. The others segment includes transportation, commercial, and institutional. The power segment is estimated to hold the largest market share by 2022. Increased investments in renewable energy sources such as solar and wind are expected to drive the power segment during the forecast period. The power system simulator market has been analyzed with respect to 6 regions, namely, North America, Europe, Asia Pacific, South America, the Middle East, and Africa. North America is expected to dominate the power system simulator market during the forecast period. Increasing investments in the renewable energy and metals and mining markets and a positive outlook on the shale oil market are the key factors driving the power system simulator market in North America. The figure below shows the market sizes and CAGRs for the year 2022 in various regions. The major factor restraining the growth of the power system simulator market is the lack of data security. Increasing occurrences of viruses and cyber-attacks are leading to security concerns. Important information can be stolen by malicious viruses in computer systems, which can cause a major loss to industries. Some of the leading players in the power system simulator market include ABB (Switzerland), Schneider Electric (France), Siemens (Germany), GE (US), ETAP (US), RTDS Technologies (Canada), MathWorks (US), OPAL-RT (Canada), and Eaton (Ireland).